Congratulations to Dr Eimear Gleeson, previously of the NCRC, winner of a Journal of Thrombosis and Haemostasis (JTH) Editors’ Award 2018 for best manuscripts published in JTH in 2017/2018. 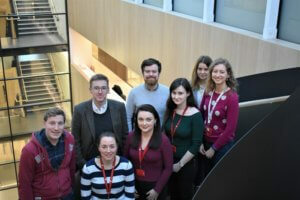 Dr Gleeson received this award for her first-authorship on the JTH paper ‘A novel protein C–factor VII chimera provides new insights into the structural requirements for cytoprotective protease-activated receptor 1 signalling’. The senior author on the paper, that is the Principal Investigator of the lab that enabled the research, was Dr Roger Preston. The aim of Dr Preston’s group is to develop new and more effective treatments for inflammatory disease in adults and children. By understanding how blood proteins impact inflamed cells like those found in diseased tissue, Dr Preston aims to design better targeted therapies. Investigating how potential drug candidates like these affect cell inflammation is a first and vital step in our understanding of any disease. This paper is an important piece of research that provides new insights into how a vital anticoagulant and anti-inflammatory protein in the blood ‘communicates’ with cells it encounters – both on the surface of blood vessels and circulating in the blood. These new insights are important in enabling Dr Preston’s group to better tailor new engineered anti-inflammatory therapies and provides another piece in the puzzle towards developing new therapies for improved treatment of the many inflammatory diseases that affect children.